This Community Post was written by Educational Theatre Company and underwritten by Washington Workplace. For the past 20 years, the Educational Theatre Company (ETC) has maintained a mission to facilitate transformation through the arts by offering year-round programming to ages 3 to 103. ETC offers camps, in-school and after school classes, Shakespeare in Schools performances/workshops, preschool classes, as well as workshops for senior citizens. One of ETC’s most exciting and innovative offerings is the intergenerational Devising Hope program. In 2015, ETC received funding to develop a partnership with Street Sense Media, a non-profit organization utilizing many forms of media to support men and women impacted by homelessness. The partnership came to be known as Devising Hope. 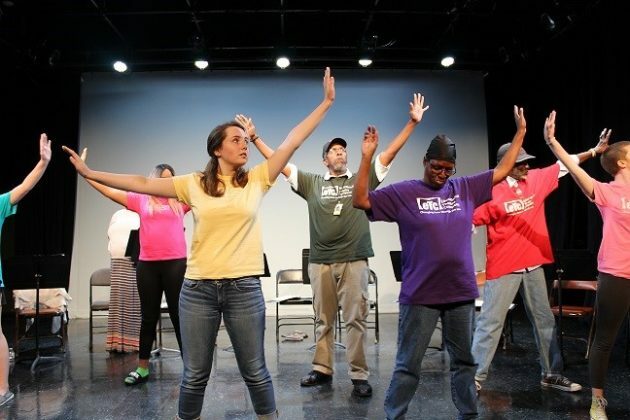 Through Devising Hope, local teens and Street Sense Media program participants develop a devised script based on improvisation, themes from plays and personal stories, culminating in a public performance. By bringing together local teens and men and women experiencing homelessness, ETC and Street Sense Media hope to change the way we see and stereotype each other, and to point awareness toward those who feel unseen and underrepresented. Devising Hope’s next public performance will be on Tuesday, March 12, 7 p.m. (Busboys and Poets, 2021 14th & V, Washington) and Wednesday, March 13, 7 p.m. (The Sycamore School). For more information on ETC programming, visit our website at www.educationaltheatrecompany.org. ETC would like to thank Janet Kopenhaver at Embracing Arlington Arts for her continued support.